When properly installed, gutters direct roof runoff into a downspout system and safely away from the house. For gutters to work properly, they must be properly sloped toward the downspouts, and the roof must have a drip edge that clears the sides of the gutters closest to the house. When water drips between the fascia and the gutters, the problem could be a compromised drip edge, but it's also possible the gutters are overflowing. Assuming the gutters have the correct slope, the main reason for overflows is that the gutters are full of debris and need to be cleaned. 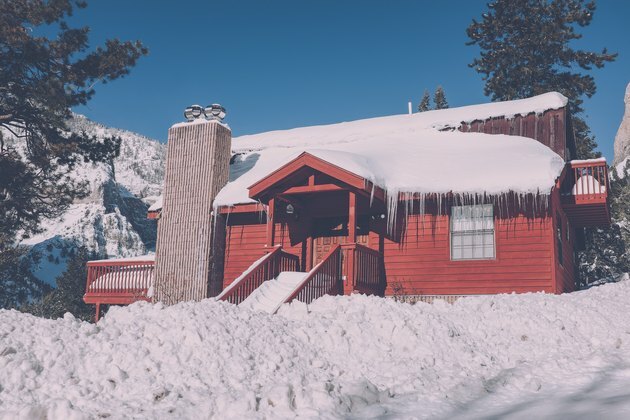 Failure to install and maintain gutters can result in dangerous icicles in winter. The proper slope for gutters is 1/2 inch per 10 feet toward the downspout. When you place a level on the bottom of the gutter, at least a quarter of the bubble should move outside the center mark, away from the downspout. When you're checking the level of your gutters, you should also check for missing hangers, which can cause dips and sags in the gutters. If a sag is deep enough, water can overflow from that point in the gutter. When replacing hangers, always keep a level handy to ensure a uniform slope. If you don't have gutter guards, you need to clean out your gutters at least once a year -- some roofers even recommend doing it twice a year. It's a dirty job and -- if you have a high roof -- it can be dangerous, so you may want to hire a pro to do it. If you don't clean the gutters regularly, water can seep over the edge, along the soffit and down the siding. This not only discolors and deteriorates the siding, it can cause leaks in the house and create erosion problems for the foundation. Some gutter backups are caused by blockages in the downspouts. You can often clear these by spraying water from a garden hose directly into the downspouts. If that doesn't work, it's not a big job to remove the downspouts and clean them out manually. Get Gutter Guards: If you don't relish the thought of regular gutter cleaning, fit your gutters with gutter guards, but beware of wide-mesh guards that allow pine needles and smaller debris to pass through. You'll still have to clean the gutters, and the mesh will make the job harder. Micro-mesh gutter guards are the best on the market, according to the NCR Consumer Advocacy Group. They allow water through but keep out pine needles and shingle sand, both of which can collect near downspouts and clog the gutters. The drip edge is a piece of flashing that goes underneath the roof covering and wraps around the edge of the roof decking. By adding an inch to the edge of the roof, an F8 or T-style drip edge ensures runoff ends up falling into the gutters, and not beside them. All styles of drip edge protect the edge of the decking from rot. If your roof doesn't have a drip edge, it's easy to install one. Simply lift the edges of the shingles, slide the drip edge underneath them and fasten it to the decking with 1-inch screws or nails. You can choose from a variety of styles, but F8 and T-style are the best for preventing seepage between the gutters and the fascia. If you already have a drip edge, and water is seeping underneath it, that's a good indication the rot on your roof decking is advanced. Although it's a big job, the only way to correct this problem permanently is to replace the rotted decking. If you notice water dripping only from a specific place, and you can verify that the gutters are clean and have the proper slope, note whether the water is coming from a joint. If it is, you may have to reseal the joint or, at worst, replace that section of the gutter. Use a commercial gutter sealant to patch leaks in seams. It will also stop leaks from small holes and cracks. Vinyl gutters with cracks more than about 3/4 inch in length should be replaced.